Background. The research onthe crisis of leadership in Gereja Kristen Perjanjian Baru (GKPB) Garut in 2011-2012 has concluded the need for an ideal top leader. As a response to that conclusion, I tried to construct a dialogical tool to evaluate the leadership of GKPB during the period 2011-2018. I found that theology of leadership in the book of Exodus is adequate to be its tool. The purpose. 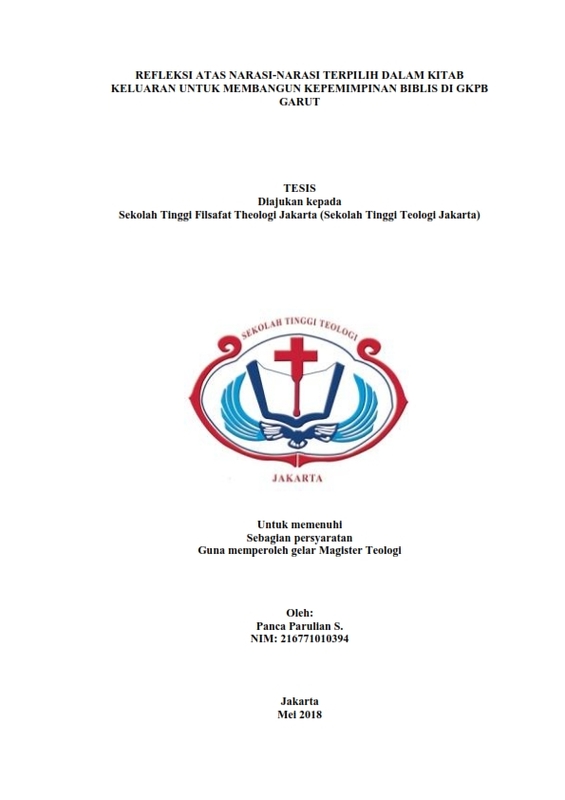 The purpose of this biblical research is to expose theology of leadership in the book of Exodus that will be effective as a tool for theological dialogue among leaders in Gereja Kristen Perjanjian Baru. And the result of the dialogues will be syntesized as a resource for the characteristics of the ideal top leader in GKPB Garut. The biblical methods. I begin with the construction of biblical methodology to accomplish the point of view of leadership in the book of Exodus. I will be using: (1) Clinton’s perspective of view on leadership in the book of Exodus, (2) Northouse’s perspective about leadership theory, and (3) Fretheim’s perspective on theological perspective on the book of Exodus. I argue that the synthesis of those perspectives will construct the process of leadership and the value of leadership with broader view, which is not only focused on leaders, and will also see other components of leadership: followers and situations. The results. The theological dialogue results are (1) GKPB Garut needs a mutual relationship between the leaders and their subordinates; (2) GKPB Garut needs a transformative leadership that organize the emergence of the leaders; (3) GKPB Garut is very concerned on traits, styles, and skills of leaderhsip issues; (4) GKPB Garut has typical form of leadership, that is team leadership; (5) and GKPB Garut needs authentic leader.